Actually, it’s more proper to introduce her as Pastora Danya since the term Pastor is masculine. But our English makes no such designation. Each day I am trying to introduce a pastor to you for the purpose of including them in your prayers. I have had to explain these videos more than once to people who are close enough to speak to me. For those who are not that close, I can only assume you may have some of the same questions. What you hear Pastor Danya say is, God bless you. My name is Danya Lopez. She then gives the name of her church (iglesia) and lets you know it is in the community of El Penon. I hope that sounds familiar to you. If it does, that is a good thing! You’ve been keeping up with these posts. 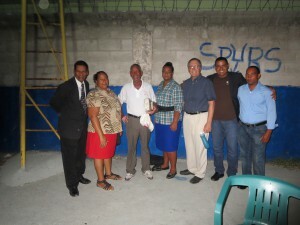 Pastor Garcia and Pastor Kelvin also serve churches in El Penon. 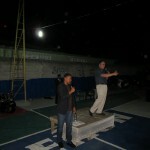 After the crusade services in El Penon we took several pictures. In the photo above she is the one standing next to me. Pastor Danya has not yet graduated from the Mathes Pastor Training School. She is not able to attend every seminar, but she is nearing graduation. Please keep her in your prayers. She wants to graduate. Pastor Danya plans to be present at the end of December for our Church Planting Seminar. Please pray for us and all the pastors as we work and plan for this big step. 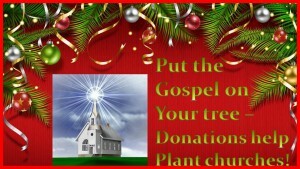 Why do we undertake planting churches? Simply put, it’s God’s game plan for spreading His message of love and forgiveness. We are doing it with this group of pastors because they have proven themselves faithful to share the Gospel with others. That should make you ask, How faithful have they been? It’s a great question and a cause for celebration. To find the answer, you’ll have to tune into the blog page! Pastor Kelvin is another continuing student in the Mathes Pastor Training School. He was a member of our first graduating class this past March. Pastor Kelvin leads the Maranatha Church in El Penon near Barahona, Dominican Republic. We were in Barahona last month for another week-long study intensive for the pastors. We often have “lab” projects to help train the pastors in various things. Last month we had them plan and coordinate simultaneous crusade services. Those services were held in three communities where are pastors serve. One of those communities was El Penon. Pastor Kelvin and Pastor Garcia had leadership roles in that service. 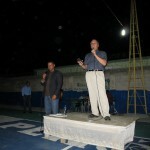 As it worked out, I was privileged to preach in El Penon and work with these men as well as some others. It was a great night because we saw 22 people accept Christ that night. Pastor Kelvin, Pastor Garcia and others will be part of our church planting effort in 2015. Please pray for these pastors. It will take a great deal of prayer, time, and resources to help plant new churches. There is much more information about the need for prayer in the latest Prayer Series on the blog page. 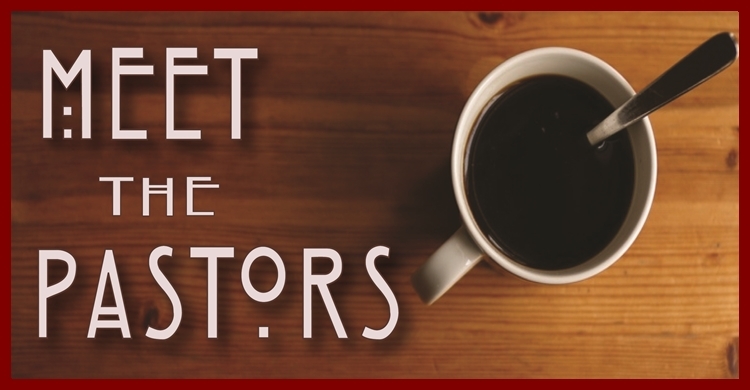 The Meet the Pastors Series will continue here, so please stay engaged here as well as the blog page. Pastor Garcia is a delightful man. He has a great sense of humor. He is a faithful student of God’s Word. 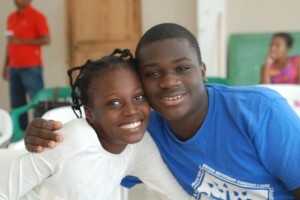 He is a continuing student at the Mathes Pastor Training School. He is also a graduate of the school. And he has designated himself as something else. 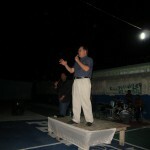 It has been a great blessing to me to teach men like Pastor Garcia. Part of that blessing is the men who help me teach. This past year at least 16 men have served as faculty for the school. One of those is my father. 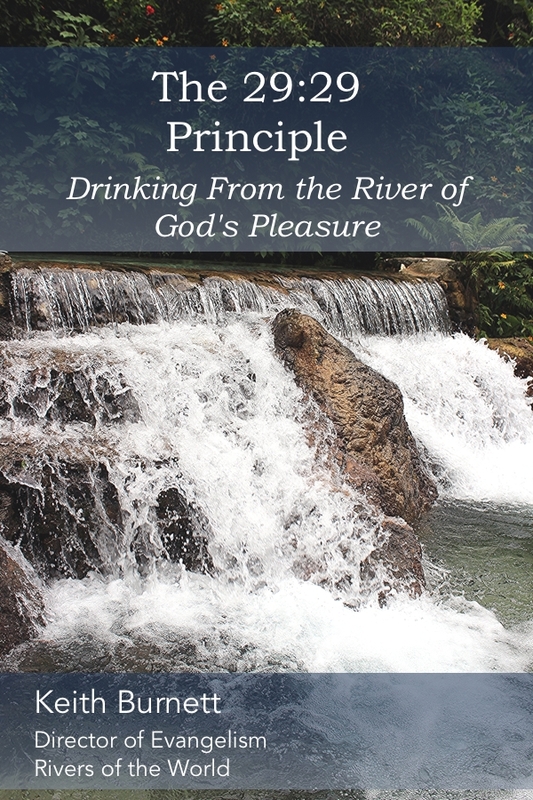 That’s fun, it’s a blessing, and it’s part of Pastor Garcia’s designation. Dad is in good health, he enjoys teaching these pastors, and they love him. They easily recognize the wisdom that comes with about 60 years of pastoral experience. When Dad isn’t able to go with us all the pastors ask about him. As a matter of fact, any pastor who has taught with me is inquired about if they are not present. These pastors take note of the ones who are willing to invest in them and they appreciate it greatly. Three weeks ago Pastor Garcia was talking with me and Dad during a class break. He stood close to me and positiioned the two of us so we were side by side facing my Dad. Then he said, I am your brother! With that he motioned toward my father indicating we were both his sons. I was surprised, moved, and blessed. That is the kind of love and respect these men display to us as we teach them. And that is an important factor in the upcoming year. People here need to hear the Word, too. Dad acknowledged the truth of that statement. He then added: But the difference is, people there listen. That’s very true. And they will be listening at the end of this month as we return for a special seminar for next year’s ministry plan. Stay tuned to the blog posts for more information. And please remember to pray for us and all the pastors. The video below is a literal picture of answered prayer. But without the background story you can’t know that. Unless you know, you can’t be blessed by meeting Pastor Alejandro. This story is really about his wife. 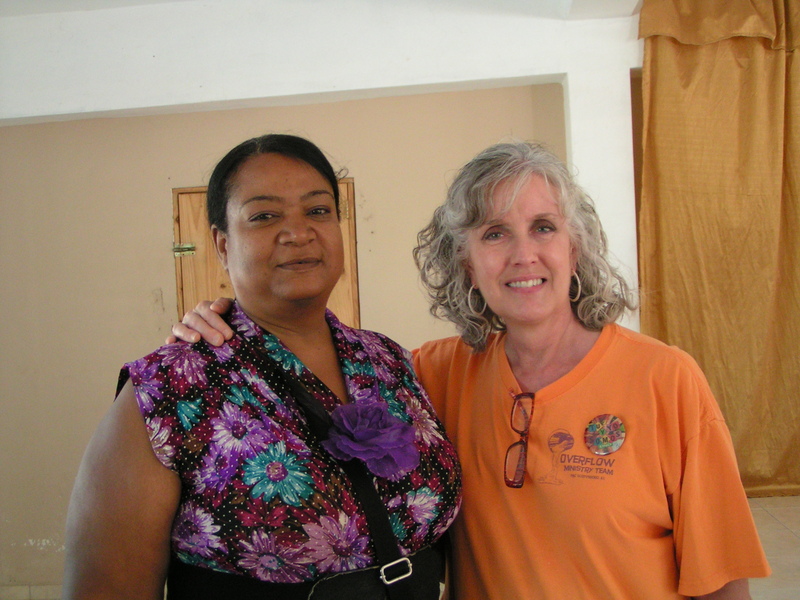 She attended the Mathes Pastor Training School in Barahona from the beginning. She is kind, quiet, gentle, and strong. It didn’t take long for us to learn some of her story. It started with her request for prayer. I never knew all the ‘particulars‘ but I did get the big picture. That story was confirmed by other local pastors. And believe it or not, a church ‘fuss’ was at the center of an incredible and unfortunate string of events. 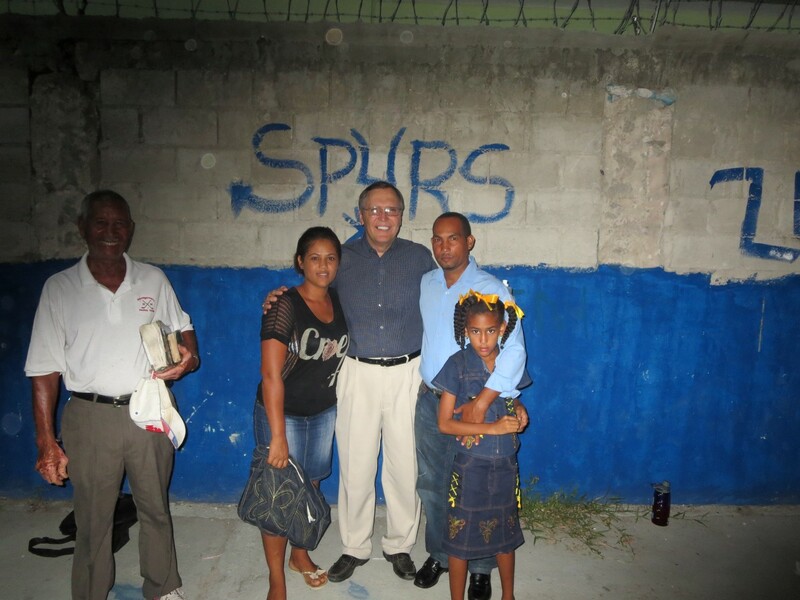 Pastor Alejandro was in jail when his wife began attending the pastors’ school. 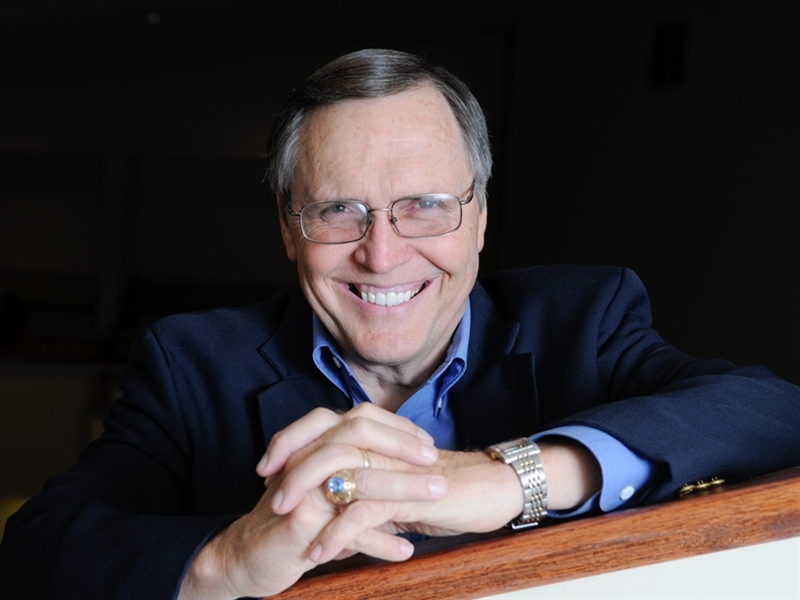 Jealousy over ministry success and a church location were factors in his circumstances. People who were jealous over his ministry success made charges against him concerning church property. The legal authorities involved seemed to know something was amiss, but based on the ‘facts’ at hand didn’t have much choice in their course of action. I am told they were as lenient as they could possibly be. All that could be done to help this pastor was done but he still went to jail. Leadership of the church fell to his wife. She needed a great deal of help and a great deal of prayer. She got both. While leading the church, attending the Mathes Pastor Training School, and caring for her imprisoned husband this incredible woman always managed to wear a smile. I got an up close view of that smile this past spring. Her smile was radiant as I shook her hand, gave her a diploma, and congratulated her on graduating. Even then she didn’t know when her husband would be released. That week of class was like the ones that preceded it. We asked about her husband. She would ask for prayer and we prayed with her. And more than once, pastors who went with me to teach gave her a few dollars to help take care of her husband’s meals and laundry. There is no way to anticipate all the ministry opportunities God will put in our paths. Why tell the story? The Mathes Pastor Training School is an answer to prayer. 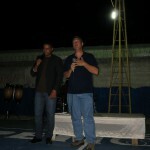 The pastors in the school are incredible people and God is doing awesome things through them. All the people who pray for this ministry and support it have a part in the work of those pastors. One answered prayer leads to another and every one of them is cause for encouragement and celebration! 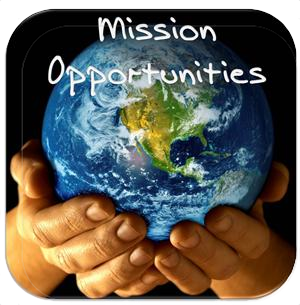 Prayer is the mission. The Mathes Pastor Training School exists because of prayer. Lives have been changed in answer to prayer. Communities are being transformed in answer to prayer. Our Father promises to do more than we can ask or imagine! Do you believe that? Our words say we believe it. But do our prayers say that? How should that truth shape our prayers? The answer is simple and challenging. First, we should be praying for the biggest things possible. The One to Whom we pray has unlimited resources and unlimited power. Is there anything beyond His reach? Why ask for small things? Second, we should ask for bold things. The writer of Hebrews tells us we may come before the Lord’s throne boldy. We can be confident in His desire to hear our prayers as well as His ability to answer them. More than we can ask or imagine (Ephesians 3:20). Pastor Jack is one person who needs this kind of prayer. The truth is, we all need it. But I’m introducing you to Pastor Jack and asking you to pray for him. I’ll be doing the same for others. And that is part of the big, bold, beyond prayer I am praying. I’ll be sharing that prayer with you this week. Please check back because big, bold, beyond prayers take a little explaining. And those are the prayers we know for certain God answered because that’s the only possible explanation. Think about it! So here’s a point to ponder: The size of our prayers is determined by our belief in God’s greatness.